Economic growth across the South-East Asia (SEA) region is expected to slow in 2019 to 5%, after an estimated 5.3% in 2018, according to ICAEW’s latest Economic Insight: South-East Asia report. US-China tensions and the resulting slowdown in Chinese demand will weigh significantly on SEA growth, especially for export-dependent economies with a high level of exports to China like Singapore and Malaysia. Economic growth continued to moderate across most SEA economies in Q3 2018, with the average GDP growth slowing to 4.8% year-on-year, from 5.2% in Q2 2018. Vietnam was the exception with GDP growth accelerating 6.9% on the year, up from 6.7% in Q2 as FDI inflows continued to support growth in manufacturing activity and exports. GDP growth across the region is set to slow next year, as many of the region's economies are small, open and heavily dependent on exports to China due to both supply-chain linkages as well as tightening Chinese domestic demand. Amongst SEA economies, Singapore is expected to experience the sharpest slowdown, with the country’s GDP growth set to moderate from an expected 3.3% in 2018 to 2.5% in 2019. Conversely, Indonesia and the Philippines will be the least affected. 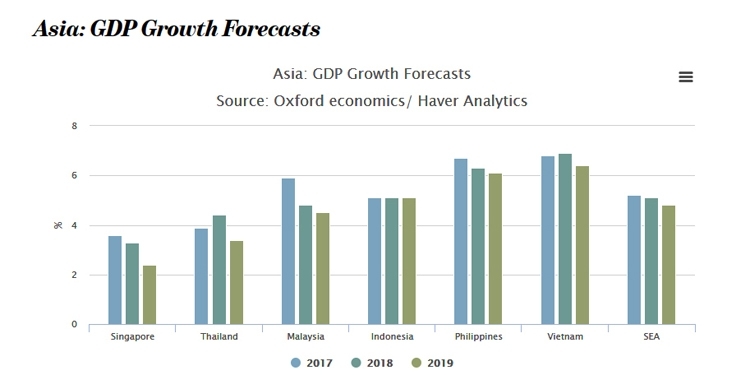 As such, while growth is set to ease in Vietnam, Indonesia and the Philippines in 2019, they will still be amongst the top ten fastest growing economies globally. Domestic demand will likely provide some relief amid a more difficult outlook for exports. Expansionary fiscal policy will help, with fiscal spending expected to be strong in Indonesia, Thailand and the Philippines ahead of upcoming elections in H1 2019. In addition, many governments in the region, including Indonesia and Malaysia, are expected to miss their ambitious fiscal consolidation targets for 2019. In Vietnam, while the government’s fiscal position has improved, there is limited space for any expansionary fiscal policy next year. However, domestic demand growth is unlikely to reach the stellar pace achieved in 2018, in part because of lower monetary policy support. Indonesia and the Philippines, have been more aggressive than their peers with policy rates raised 175bp a piece, in a bid to support their respective currencies. Looking ahead, central banks are expected to continue tightening over 2019.